Legendary French duo of producer extraordinaire I:Cube and Versatile label owner Gilb’r are coming stateside for a very rare appearance and we are super excited to be hosting their NY party! To seal the deal we’ve called upon the finest Bostonian crate-digger – DJ Kon of the Kon&Amir duo known worldwide for their OnTrack/OffTrack mixes and compilations on Rapster/BBE. Over the 15 years of impeccable releases and remixes Chateau Flight have earned an iconic status for their distinct take on the avant-garde dance sound. If you’ve listened to one of their albums on Versatile or the astonishing Baroque EP on Innervisions then you already know that you’re in for a rare treat. However, If you aren’t yet familiar with I:Cube and Gilb’R then you are about to discover a whole world of beautiful and evocative sounds. Whichever genre the duo dive into, the end result is rarely predictable yet reliably consummate and moving. Allow us to introduce the Chateau Flight. DJ Gilb’r has been working hard in Parisian music scene since the early 90s, first via programming and playing shows on the revered Radio Nova, later by recording a stone-cold house classic “Sunshine People” as Venus and, most importantly, starting his music label Versatile Records, a visionary imprint which has produced numerous EPs and albums by Joakim, I:Cube, Pepe Bradock and Chateau Flight while introducing the world to such names as Fabrice Lig, Tonny Lionni and Basic Soul Unit. I:Cube in turn is a humble genius behind some of the most memorable dance and electronic music of the last two decades. Stylistically ranging from space techno to relentless disco and from quirky pop songs to smoked-out dub numbers, his compositions embody the spirit of adventurous musical exploration, as he himself admits there’s no knowing what a track will sound like until it is done. At the heart of I:Cube records are inventive sounds and simple structures layered in such an elegant and sophisticated way that it is safe to call his style inimitable. To complete this night of unpredictable brilliance we have enlisted the finest purveyor of rare groove – DJ Kon of the famed Kon & Amir duo. Starting with a chance meeting at Boston’s Biscuithead Records the two have entered into an alliance that sent them on a crate-digging quest to unearth and sometimes edit the lost gems of funk, soul, jazz, reggae and hip-hop. Their deep knowledge of music and skill behind the turntables soon cought attention of seasoned heads both stateside and overseas, finally landing them the honor of compiling “The Kings of Digging” compilation on K7!’s sub-label Rapster. To give you the scope other entries in the “King of..” series were compiled by Laurent Garnier, Carl Craig, Gilles Peterson, Jazzanova, MAW, etc. In addition to that Kon & Amir have lent their expertise to such entities as Dr. Dre, Diamond D, Pete Rock and Wax Poetics. 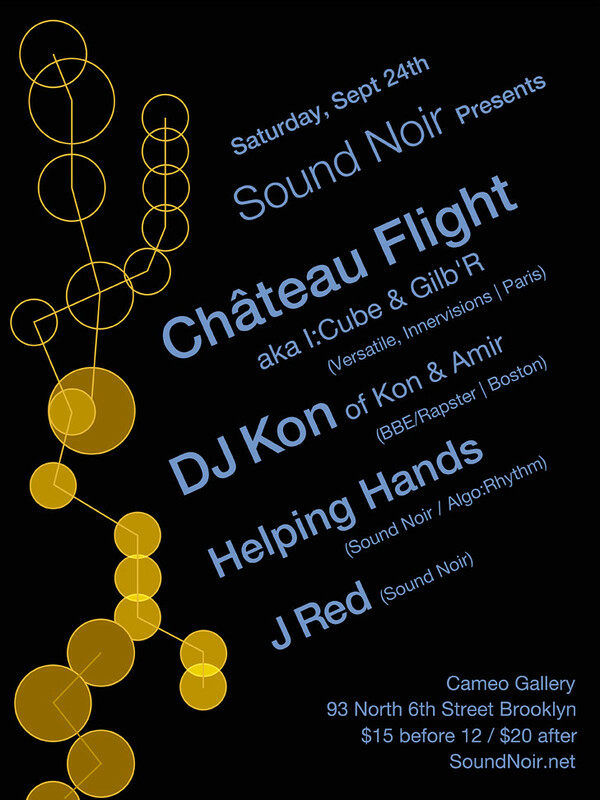 Kon told us that for the Sound Noir night he will venture into a new direction and give us a taste of his own unique style – we get ready to get schooled. 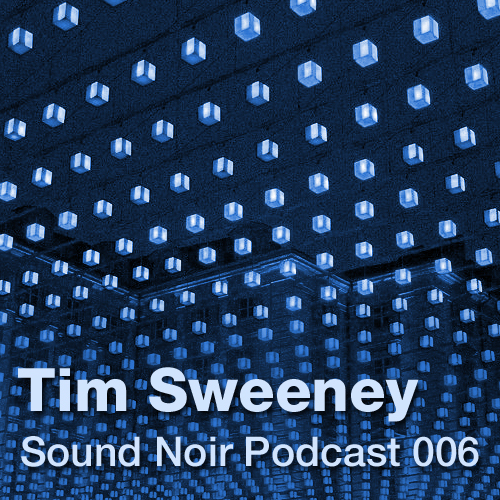 Our latest podcast is by NY’s finest selector and our recent guest Tim Sweeney. In fact it is a recording of the first hour of Tim’s set from the supremely special DJ Sprinkles event, helping you to either re-live the happy moments or hear what you missed out on. Slowly building from seductive disco and playful retro goodness up towards radiant dance tracks, it will start your August weekend right just like it fired up our June party. You can subscribe to the podcast which makes it easier to stay on top of our random publishing schedule. You can also directly download the mix here, or subscribe using iTunes. To stream the mix use the player directly below. Rain or SHINE. Bar and grill. Fun in the sun. A legendary figure in electronic music, Chez Damier has played close witness to many of the pivotal moments in the history of house and techno. Jointly responsible with partner Ron Trent for both Prescription Records – widely recognised as one of the greatest labels of all time – and The Morning Factory – one of the most ethereal jams ever to rock a room – Chez Damier carries abound the soul of house music. Mike Servito is a lifelong music fanatic with a truly unique ability to move a dance floor. Fearless in his seamless transitions from one style to another, Servito has an unpredictability and a deep trust in his music knowledge that has garnered him a cult following and made him an in-demand DJ the world over. More info is on Facebook and on RA. 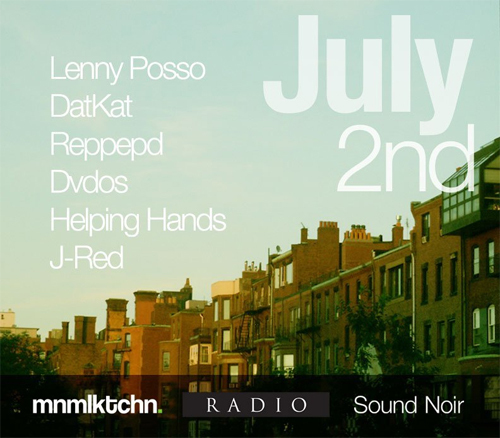 This Saturday, July 2nd we invite you to start your long weekend by enjoying the summer sun, the fine LIC air and the party sounds by people behind some of the best musical events this city has to offer – RADIO, MNMLKTCHN and SOUND NOIR crews have come together to organize a mini-marathon of awesome music and friendly vibes. It’s on at 3pm. 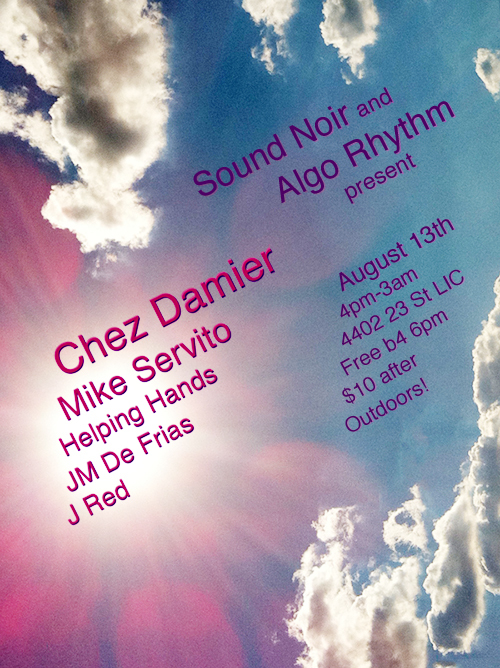 There will be BBQ and drinks, full-on sound-system and protection in case of unlikely rain. The event is 21+ and FREE but we would appreciate $5 donations to cover the costs. 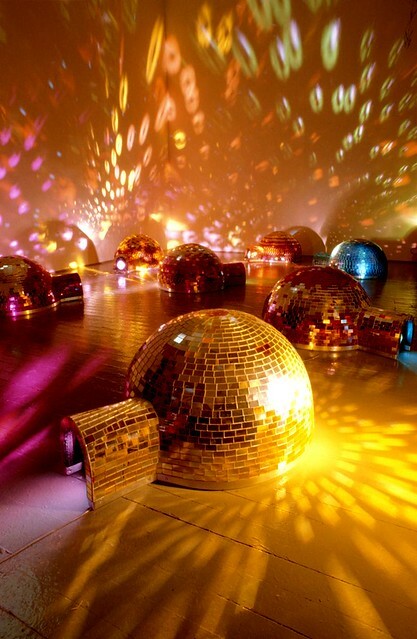 Calling all the disco dancers, all the music nerds and party mammals. Our train is about to depart – we’re going on a field trip to the world of Sprinkles. The route leads through the early days of authentic house experience to the far-away universe of Terre’s poignant compositions. It’s been over a decade since he last played in New York, so Terre has prepared a special set of rare un-touched gems and unique edits for the occasion. Whatever you will hear, you can be sure that with DJ Sprinkles music is only half of the story. Helping us welcome her back to NY is the city’s favorite DJ Tim Sweeney of Beats in Space – a man who for the past ten years has been utilizing his frightening knowledge of dance music only for the greater good of humanity, be it at a museum in Manhattan or at a bar in Jakarta. 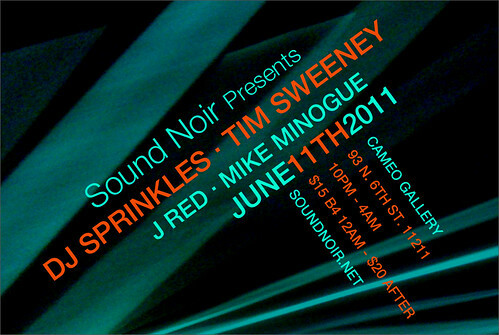 The party will start off in the basement lounge with sets by J Red and Mike Minogue and expand around midnight to the upstairs gallery where Tim and Terre will be playing all night. Claim your dancefloor space, make sure you are there early to avoid lines and save on reduced admission. Cameo Gallery is at the back of the Lovin’ Cup Cafe. It’s located in Williamsburg a short walk from Bedford Ave stop of the L train. So happy to find this bit of tropical minimalism. Original is hard to come by but both songs from that record are on this Sonar Kollective compilation from 2007. This Friday February 25th we are teaming up with Plan B recordings to bring you a one-off special night at a cozy Brooklyn loft filled with analogue sounds and digital art. 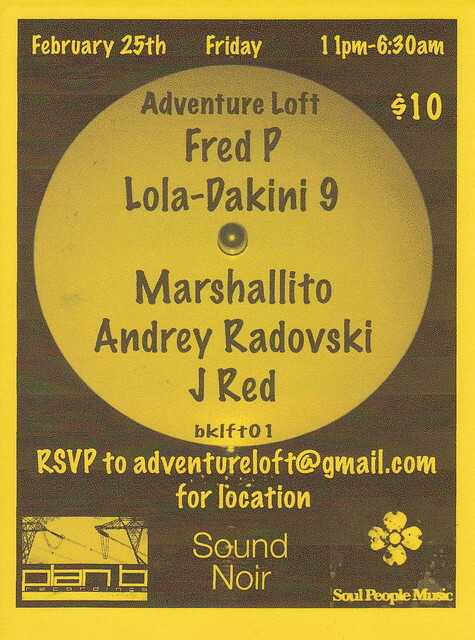 Manning the decks will be our favorite deep selector Fred P along with Plan B and Sound Noir DJs. Visual excitement will be provided by a diverse team of our creative friends who were very kind to contribute their artwork and ideas, filling the space with surprises and lights fantastic. Fred P is the name familiar by now to anyone who likes their dance music lush and emotive. After releasing numerous singles and remixes on revered imprints like Laid, Mule and Underground Quality as well as three albums under the name Black Jazz Consortium on his own label Soul People Music he has become a thought-after DJ representing the new house sound of New York at gigs that take him all across Europe and as far as Australia. Fred’s 3rd album entitled “The Incredible Adventures of Captain P” came out just a couple of months ago, taking us on a trip through his deepest sounds yet – have we got a perfect party for you to experience it! Plan B is one of the most exciting experimental dance music labels to come out recently from our hometown NY. Run by DJ Spider & Lola, the sound of diverse Plan B releases is united by the infectious offbeat rhythms, unusual samples and often brooding atmospheres. Representing this sound in its most engaging and danceable form will be Lola aka Dakini9 (celebrating her birthday!) and a newcomer to Plan B stable Marshallito – a veteran DJ/producer and a Detroit transplant who worked hard together with us to organize this event and especially to put together the high fidelity sound-system. Completing your audio-visual experience will be Disco Igloos by Andy Barrett, lazer distortions by Urbarian, artful decorations by M.aD. and video manipulations by our resident visionary Lightwerk. Introducing Dusty Rhodes with a special live performance.